Driving along Reston Parkway in Hunters Woods you may not have noticed the garden plots, picnic pavilion, basketball court, soccer field, and tot lot in addition to the swimming pool. Take this walk and see some of the things that you may not have observed from your car. The walk starts from the east side of the parking area at Hunters Woods Pool. Take the asphalt path at the end of the lot with the homes on the left. After a short distance turn right at the asphalt trail intersection. The trail crosses a creek and goes up a hill. The trail crosses Colts Neck Road. Continue straight on the trail on the other side. After a short distance a creek will appear along the right side of the trail. The trail turns right and crosses the creek. Go straight at the next 2 asphalt trail intersections from the right. The trail will go down a hill. Another asphalt trail intersects from the right shortly after crossing another creek. Continue straight along the present trail. At the next fork in the trail take the asphalt trail to the right. The trail will soon turn right again. It will pass between the homes until it reaches Steeplechase Road where it will turn left. The trail crosses Trotter Lane. Continue on the trail along Steeplechase Road. The trail crosses Steeplechase Road near the driveway next to the school. Cross that driveway and continue along the trail on the other side of Steeplechase Road. Turn right at the sidewalk along Colts Neck Road and walk past the front of Hunters Woods School. Turn right onto the asphalt path after passing Hunters Woods School. The path goes down a steep hill through the woods. After a very short distance an asphalt trail intersects from the right. Keep straight on the present trail as it follows Colts Neck Road. The trail turns left to pass through a tunnel under Colts Neck Road. Upon exiting the tunnel turn right at the trail intersection to continue along the other side of Colts Neck Road. The trail turns left to follow along Glade Drive. The trail crosses a pipeline. Continue on the present trail and enter the short section of woods. Turn left at the next trail intersection near the intersection with Reston Parkway and walk up the hill. Pass a soccer field on the left. Turn left to follow the trail around the parking area. Pass a basketball court and a tot lot on the left. The trail passes garden plots on the right. 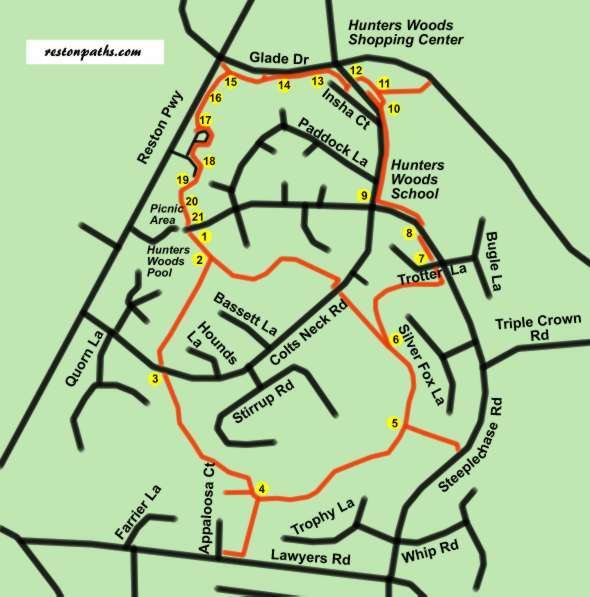 Plots may be rented from the Reston Association. The trail passes the Hunters Woods picnic pavilion. The walk ends back at the Hunters Woods pool parking lot.